If you have upgraded your old Windows PC/Laptop and installed the latest Windows 10 operating system without any upgrade error then you are lucky. But it is not the end of your problem, as there are lots of users who are suffering from Realtek audio issue just after upgrading to Windows 10 from Windows 8.1/8/7/Vista/XP. 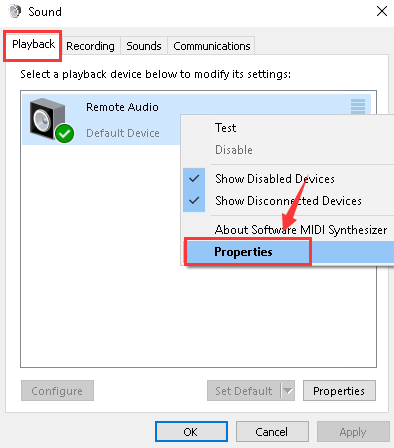 If you are encountering Realtek audio problems on your Windows 10 PC/Laptop, then you are at the right place. Here, in this blog, you will learn different solutions to troubleshoot the error. First of all, make it clear that the most common cause of sound problems is poor communication between Windows 10 OS and system’s sound card. If this is the case, then you can deal with it by using a compatible update. Update your system drivers either using manual method or going with any professional System driver updater. How to verify that the Problem is related to the System Driver? Step 1: Open the Run dialogue box by pressing the Windows + R key simultaneously. 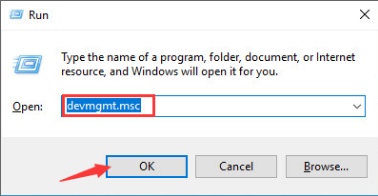 Step 2: In the run box, type devmgmt.msc and click OK. 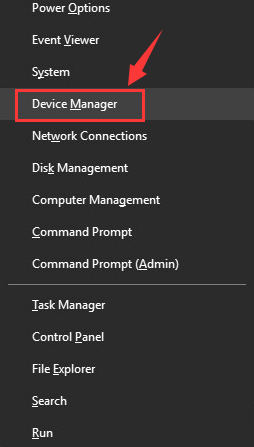 This will open the Windows 10 Device Manager. 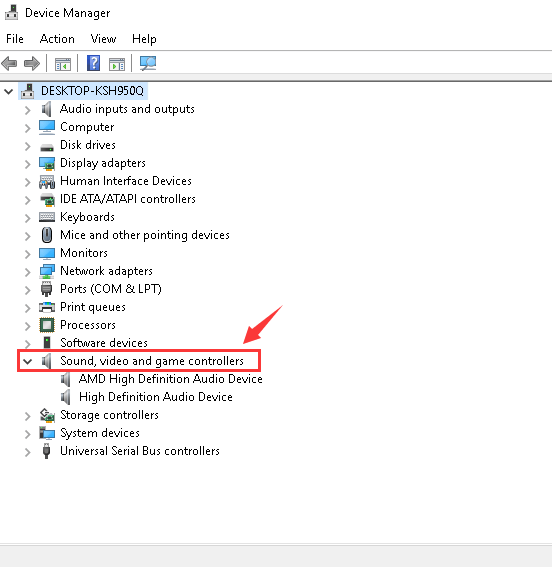 Step 3: In the Device Manager window, click on the Sound to expand it -> video and game controllers. Here you’ll see Realtek High Definition Audio. If there’s a yellow exclamation mark along with the device name then it is confirmed that there is a problem with the driver, and you need to update it. 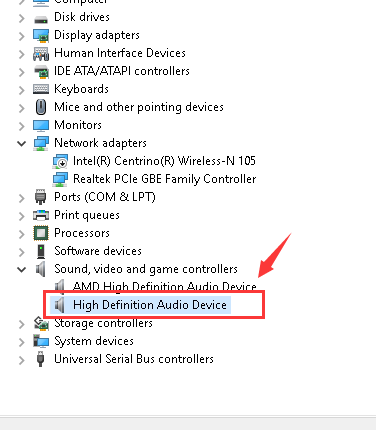 Note: It is recommended to confirm that you haven’t by chance muted your High Definition Audio device before updating Windows 10 Realtek audio drivers or applying any other fixes. Step 1: Open the Control Panel window. Press the Windows key and R simultaneously to open the run box and type ‘control’ and hit Enter key. 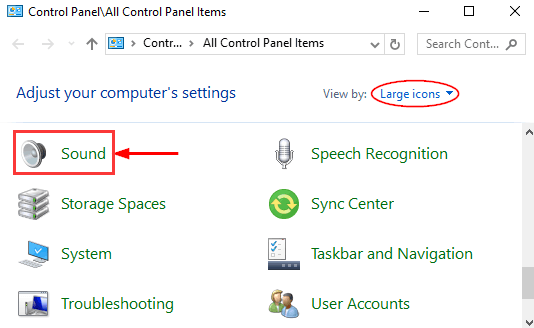 Step 2: Click on the ‘View by Large icons’ option and click on the Sound as shown in the figure. Step 3: Now, in the Playback tab, right-click on the Default Device you have and click Properties. 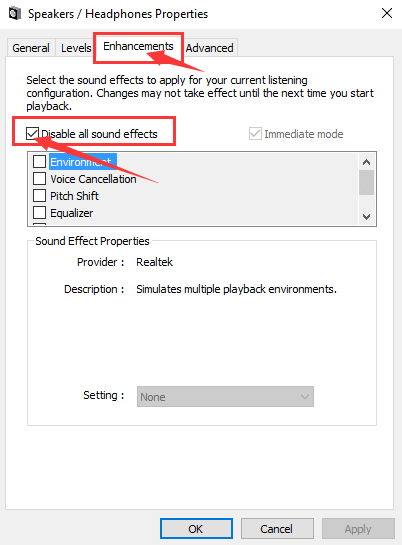 Step 4: After it, navigate to the Enhancement tab and check the box for Disable all sound effects. Step 5: At last, check your PC sound. 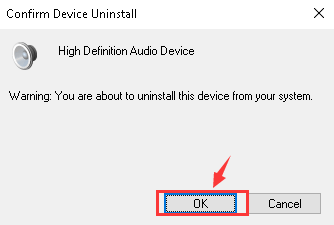 If the audio issue is still unfixed then choose to Cancel here, and then repeat step 2 and step 3 with all of your other default devices. Make sure that all of your speaker and headphone connections are connected properly and not inserted into the wrong jack or loose. The headphones are plugged in properly, sometimes the speakers might not work if you have plugged in the headphones. 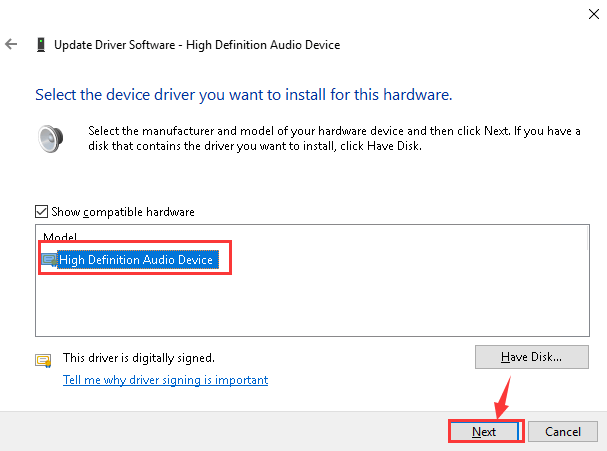 If the Windows 10 audio issue is still not fixed after applying the first two methods then you need to update the outdated sound driver. In order to update the audio driver, you can either go with the manual steps or install a professional system driver updater tool. In order to update the audio driver manually, you need to visit the manufacturer’s website for your audio card, and search for the latest compatible driver for your PC/Laptop. 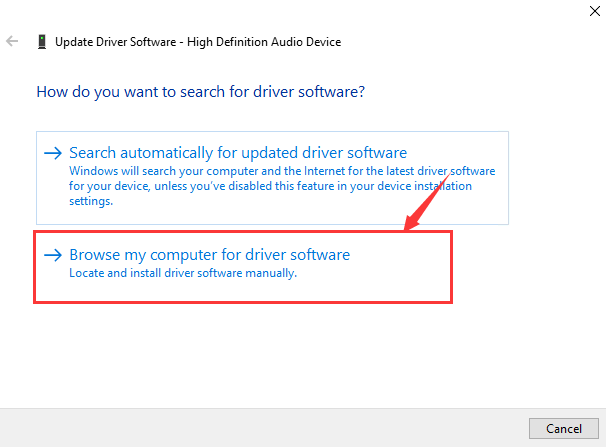 If you are unable to update your audio drivers via using manual method then you should use automatic driver updater software. This tool will you’re your precious time, don’t need any computer skills and very simple to apply. This type of software will automatically detect the system’s driver related problems and find the correct system drivers for your exact audio card. This fix is to overcome from the faulty driver situation. Sometime users may install faulty or incompatible audio driver on their system and make their system incompatible with the audio hardware. Step 1: Press the Windows key and X at the same time, then click on the Device Manager. Step 2: Click on the Sound to expand it, video and game controllers. 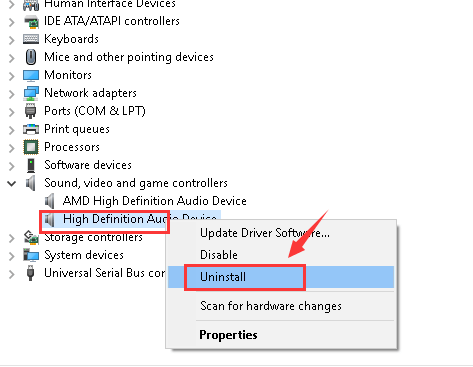 Step 3: Right-click on the sound card driver and then click Uninstall. Click on the OK if system prompted any notification. Step 4: After the completion of the installation process, reboot your computer. If you are still unable to fix the audio problem then you need to follow our last fix. Step 1: Open the Device Manager by pressing Windows and X simultaneously. Then click on the Device Manager. 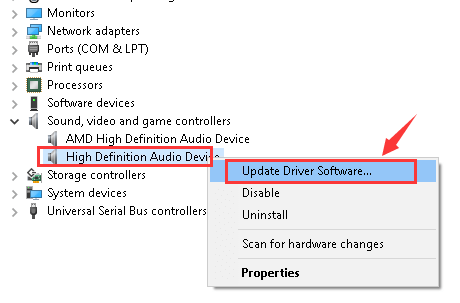 Step 3: Right-click on your sound card driver and then click Update Driver Software…. Step 4: Click on the Browse my computer for driver software. Step 5: Again click Let me pick from a list of device drivers on my computer. Step 6: Then Click on the High Definition Audio Device, and Next. If any confirmation prompts then Click on the Yes to continue. 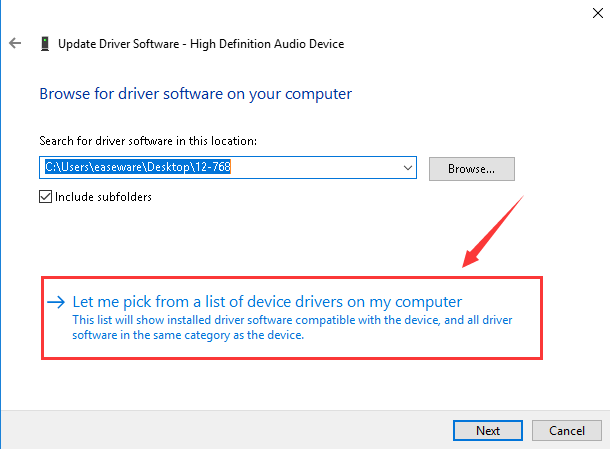 Step 7: After it, you can see that the system driver you are having now is the generic audio driver provided by Windows 10. At last, verify that your PC/Laptop sound is back or not. 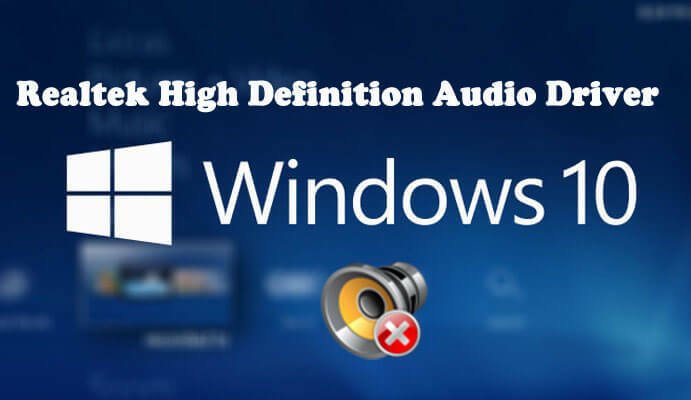 That’s all about the Realtek High Definition Audio Driver issue, all the above-given solutions are completely tested over Windows 10 system. So don’t worry and apply them one by one. After applying each of them it is suggested to check for the issue. After solving Realtek High Definition Audio Driver problem you should scan your PC/Laptop with a professional PC Error Scanner. 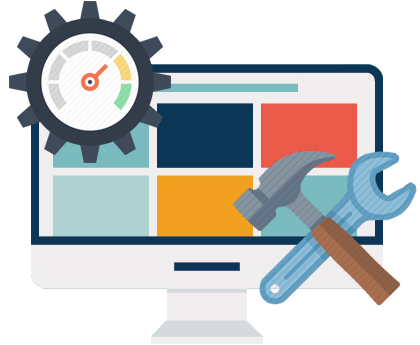 This will help your PC to deal with other system errors that you can’t be fixed manually. Simply, download, install and run this tool. 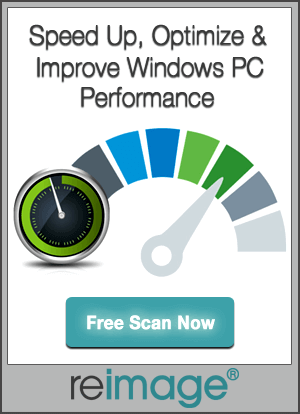 It will automatically scan your PC for any errors and make them error free completely. 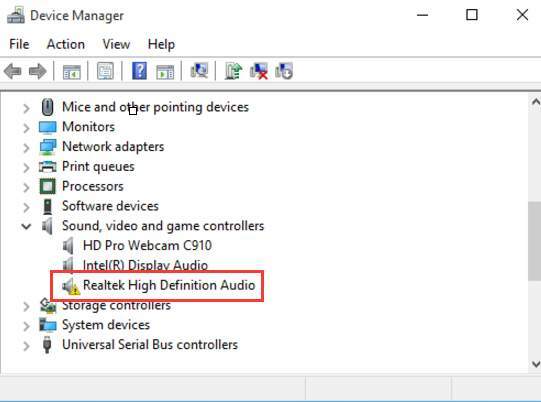 Read the Top 5 Tested Fixes for Realtek High Definition Audio Driver Issue for Windows 10 and make your PC/Laptop normal. Apply the given fixes one by one and check for the error after each one. [Tutorial] How to Fix Windows Update Error 0x80070bc2 in Windows 10?